A quiz concerning the Christmas story from a biblical perspective. Paul Rutherford suggests using three fulfilled biblical prophecies as an apologetic for biblical truth. What was the Star of Bethlehem? Some people suggest is was an astronomical conjunction of planets and stars. But it might have been the Shekinah Glory, a physical manifestation of God’s presence on earth. Todd Kappelman highlights some favorite films of the Christmas season, encouraging Christians to enjoy the films while separating the sacred from the secular: A Christmas Carol, Miracle on 34th Street, How the Grinch Stole Christmas, It’s a Wonderful Life, and A Charlie Brown Christmas. Probe Radio producer Steven Davis wrote the scripts providing devotional insights into five Christmas carols, and his son and Mind Games Camp alumnus Jon Clive Davis wrote and performed the music underneath. Probe Radio producer Steven Davis wrote five more scripts providing devotional insights into five Christmas carols, and his son and Mind Games Camp alumnus Jon Clive Davis wrote and performed the music underneath. For the third year in a row, Steven Davis and his son Jon Clive Davis collaborated on a new look at five Christmas carols, accompanied throughout each day’s broadcast by new compositions of each carol. A look at the theology behind five Christmas carols: Come Thou Long Expected Jesus, Hark the Herald Angels Sing, Joy to the World, O Little Town of Bethlehem, and O Holy Night. The visible presence of God in the Old Testament—the Shekinah glory—shows up again at Christmas. No wonder we like shiny, sparkly things that remind us of the glory of heaven! Christians have had to respond to the customs of the surrounding culture since the beginning of the church. In the end, though, Christmas is necessary only in terms of its historical and theological content. Sue blogs that Jesus is the only person who had a life before His birth, which we celebrate at Christmas. Christmas often means time with family, hectic shopping, parties, cards and gifts. But what about the first Christmas? Why is the original story the baby in a manger, shepherds, wise men, angels important, if at all? The answer may surprise you. 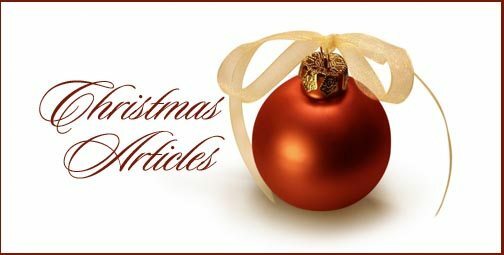 The founder of Probe Ministries examines the role of the wreath in Christmas. A short essay on the role of light at Christmas. Jimmy Williams examines the symbolic and prophetic role of the stable in Christmas. Have you ever missed a great opportunity because you weren’t listening carefully? Twenty centuries ago some clues to impending good news of monumental import eluded most folks. Fascinating prophecies of Jesus’ birth and life bring revealing insights into your own life today.